Nanda Vigo is an Italian artist born in 1936. She is considered a pioneer in modern Italian art, who has continually skirted the confines of design, architecture and installation to compelling effect, in her own practice, but also collaborated with other artists such as Lucio Fontana and Giò Ponti. Her oeuvre ranges from mind-bending interiors and enigmatic light sculptures to futuristic cemetery designs. Her more recent designs have stemmed from this exploration, focusing on sensory impulses through materials such as glass, mirrors, and neon lights. Nanda started her own atelier in Milan in 1959, and soon after began exhibiting her works throughout Europe. Nanda Vigo is one of the pre-eminent names in the history of contemporary Italian art. 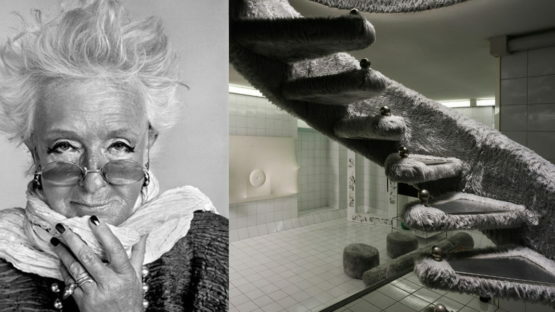 Ever since the 60s, following a constantly evolving process a world away from stereotypes and brand names, the exemplary nature of her work has inspired a generation of artists and designers. Rather than systematically repeating successful formulas, she has always pursued the path of experimentation and exploration of the new: performance, installations and happenings are integral to her artistic language, existing in parallel with the practice of architecture, which naturally led her to design. The singularity of her art celebrates her work on space, which incorporates the immaterial play of light and reflections in her works. The Chronotops, the first examples of, which date back to the early 60s, constitute the first evidence of her research. Structures of fluted glass and aluminum that capture and release through their transparency the most intense impressions of light, the Chronotops correspond to a principle of diffraction and reflection that owes more to the perception of sensory energies than to a material reality. “The definition of the Chronotop” says Nanda, “is destined to express a philosophy rather than a language of forms, even if it alludes to them. The form in this case only serves to give an informative impetus to the philosophy enabling the latter to draw the conclusion of the continuous and complete understanding of man beyond the form.” Nanda Vigo’s artistic adventure begins in Milan in late 1958 and early 1959. She initially works closely with Giò Ponti and Lucio Fontana, mentors who teach her the art of space and light in a conceptual and emotional style that will inspire her to define her own artistic philosophy. She also frequents the mythical Brera quarter, which was then the setting for all the events and discussions held by the most anti-establishment and radical artists of the time. It is here that Lucio Fontana, Piero Manzoni, Gianni Colombo, Enrico Castellani and Vincenzo Agnetti meet, along with so many others who constitute at the time a select group of people determined to promote their new vision of the world. This is where, in 1959, Nanda Vigo meets Piero Manzoni. A relationship between passion and competition is born which will last until the latter’s death in 1963. These are years rich in exchanges, and define a particular moment in history between Milan, around the Azimuth group established by Castellani, Agnetti and Manzoni, Düsseldorf’s Zero group and the New Realists in Paris. Firm beliefs and natural affinity lead Nanda Vigo to ally herself to the Zero group, whose basic “Cosmic Power” principle she adopts, preferring as she does to explore rather than to analyse, to be inspired by philosophical theories rather than by aesthetic doctrines she has never followed. Nanda Vigo has always asserted her unconditional freedom to create away from trends, schools and fashions, she remains convinced that authentic art is capable of inspiring society’s future form. She has exhibited throughout the world with the Zero group, and was featured in multiple iterations of the Triennale di Milano, as well as the Venice Biennale in 1982.The importance of her work remains self-evident.